Established in 1938, ICC is dedicated to the growth and promotion of the Chemical Industry in India and it is the apex body representing all branches of the Indian chemical industry, such as organic and inorganic chemicals, plastics and petrochemicals, dyes and dye intermediates, fertilizers and pesticides, specialty chemicals, paints, etc. During the visit, our Indian team met with Kunal Jain, the deputy secretary, and Dr. Rakesh Kumar, the officer. In our conversation, we got to know that ICC had over 500 members in the country and all of them were engaged in the chemical industry. 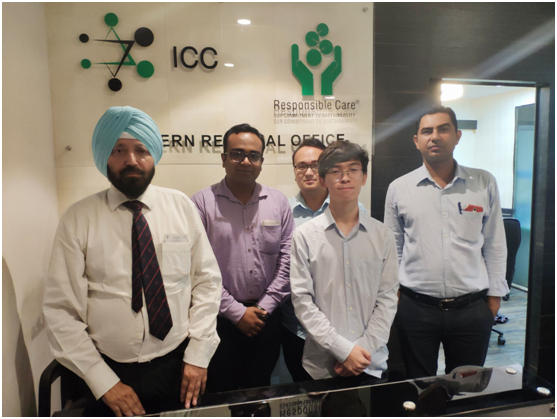 Besides, ICC have also cooperated with other renowned chemical associations in India, such as CII and ChemExcil and they could help introduce us to them. After introducing our B2B business mode, we also discussed the future cooperation and the gentlemen expressed that they could help us increase our publicity in India through their magazine advertising in Chemical News, email marketing, etc, to let more local chemical buyers and suppliers know OKCHEM. As a leading B2B platform in chemical industry, OKCHEM would help the chemical buyers and suppliers in India improve trade efficiency and provide the localized service solutions to help them grow chemical business around the globe.